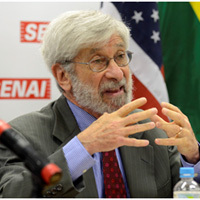 Albert Fishlow is the director of the Columbia Institute of Latin American Studies and director of the Center for the Study of Brazil at Columbia. Fishlow’s published research has addressed issues in economic history, Brazilian and Latin American development strategy as well as economic relations between industrialized and developing countries. Recent publications include Latin America in the XXI century, in Louis Emmerij, (ed. ); Economic and Social Development into the XXI century (Inter-American Development Bank, 1997); Contending with Capital Flows: What is Different about the 1990s?, in Miles Kahler, (ed. ); Capital Flows and Financial Crises (1998); and The United States and the Americas: a 21st century View with James Jones (1999). His research interests include international relations, peacekeeping, war and peace in developing countries.